Lablae District is about 8 kms. Far from Mueang Uttaradit District. 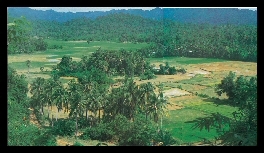 The word “Lablae” according to assumption formerly the citizens of Mueang Phrae and Muang Nan had escaped enemies and hid themselves and later formed up community there. As the terrain is thick rain forest, so strangers are who not accustomed to the terrain would easily get lost their way. Mueang Lablae is a rural village,It has been famous since long time ago with a fertile land for farming. Most of Lablae villagers engage in farming and planting. The produces that has earned income and fame for Mueang Lablae is langsat, durian, and shallot. Located at Moo 6, Ban Phrataen, Tambon Thoongyang about 14 kms. away from the province. The feature of Phrataen is a rectangular late ritestone with a width of 8 feet and a height of 3 in. having accessory pattern evidencing of being Buddha throne. It is assumed to have been built in Sukhothai period. Inside the viharn in addition to being the place where the Phrataen is situated, still there is many Sukhothai period Buddha Images. The door of viharn is very beautiful Lai Kanok (Thai design) carved wood. 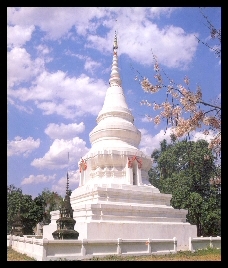 Is located on the slope of the hill of the opposite side of Wat Phranorn Buddhabahtyukol. The temple has large naga (snake) stair leading up to the area of the temple which is an ancient temple formerly called “Wat Phranorn” having mondhop built in the form of Thai style with four porches and spired roof where the Reclining Buddha image is placed inside. 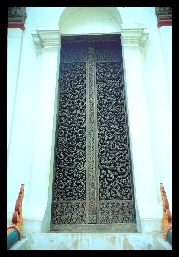 The door is carved wood primed with black lacquer and covered with gold plate. 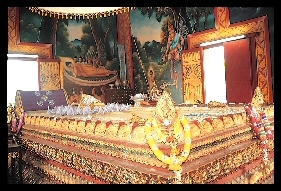 This place is respected by villagers as being a sacred anoient place which is in existent along with Wat Phrataen Sila-at and Wat Phrayuen Buddhabahtyukol. 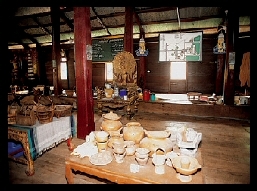 Is located in the area of Tambon Failuang as Wat Donsak. 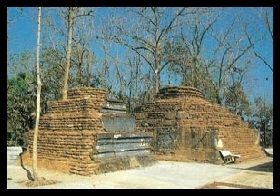 The Chedi is of Ceylon style, which was built to cover the old chedi. 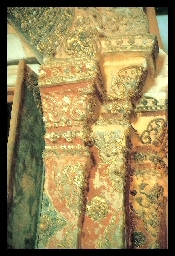 Regarding Phra Ubosot, the door and the gable has carved wood pattern. 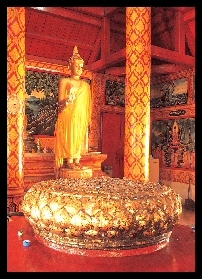 Inside the Phra Ubosot there is beautiful Sukhothai art Buddha image as presiding image. Is located at Moo. 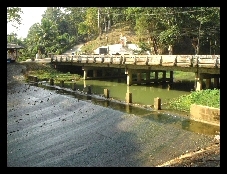 3 Tambon Failuang, about 9 kms. away from the province. This temple was built toward the end of Ayutthaya being the capital period. 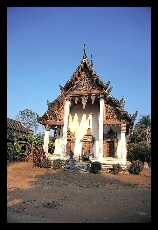 It was delicately built with Chiengsaen mixed with Sukhothai style architecture. The door of this vihara is made of wood fretwork in Kanok (Thai design) and having some himaphan animals sporadically placed in several places with delicate and very beautiful postures, the pattern of the left and right door panels differs but when the door is closed the pattern matches well with each other exactly this means that the craftsmen in that period had very high level of artistic craftsmanship. The doorpost has Kanok pattern alternatively with Kanok Karmpoo and Kanok Bai Ted. 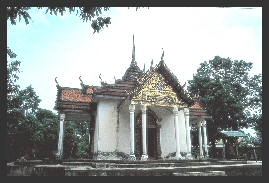 The gable is decorated with fretwork wood in pictures decorated with white color glass of Ayutthaya style. Inside the temple is very shady. Is located at Tambon Thoongyang, about 7 kms. away from the province. 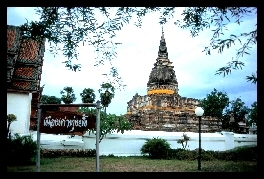 This is an ancient town of Sukhothai period. Vieng Chaongo is located inside Mueang Thoongyang with an area of about 30 rais. 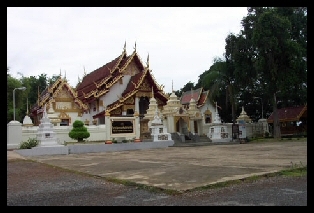 It is located in the area of the hill that has a slope downward from the area of Wat Phrataen Silaasn. 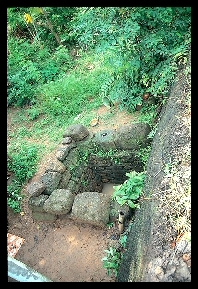 It has 2-3 layers of moats and town wall. Mueang Thoongyang has very large size covering the area of Khao Nangthong up to the area of lowland plain Ban Phailom. From the legend titled Sangthong and story told by villagers Vieng Chaongo is the town of Sangthong and Nang Rojana who were deported by Thao Samol from Mueang Thoongyang and from the evidence of 3 layers of town wall including antiques that have been discovered by excavation at several places, it is assumed that the area of Vieng Chaongo has been place of habitation of pre-historic men before. Located in Moo 7, Ban Thong Lablae, Tambon Fai Luang, about 12 kms. Away from town, could be accessible by route No.1043 from the district. As the first ruler of Mueang Lablae, Chao Fah Ham Kumarn is considered as one of the province’s important historic figures. 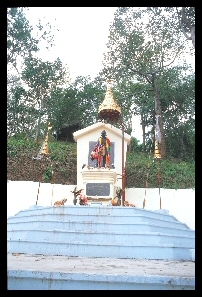 On the hill, behind this monument there is the way leading up to the good viewpoint, beautiful landscape of Mueang Lablae . The statue of Phra Sripha-nommas stands elegantly at Lablae market intersection at present. It was built by merchants, people and civil servants of Uttaradit province as a memory and thanks as well as reverences to Phra Sriphanommas he was an administrator who brought prosperity and development to this locality in many ways. He persuaded people to build road from Mueang Lablae up to Bangpho (Tha It)Later on King Rama V has given the name of this road as “Injaimee road” and also an honorary rank to Mr. Thong In as “Khun Phisalchinakij” and later on he was promoted to “Luang Sriphanommas” in B.E.2447. Until B.E. 2451, by virtue of his goodness and diligence, he was again promoted to “Phra Sriphanommas” Phra Sripha-nommas was nominated first Distritc Officer of Lablae district, so he has been admired and revered up to this day. Is located at Ban Tonklua, Tambon Mae Pool, along No. 1041-1043 Highway about 20 kms. away from the province. It is multi levelled high waterfall with beautiful natural surroundings and a sala (Pavillion) for sitting and resting to view the scenery of Mae Pool waterfall clearly. It is a tourist spot, which is near the town and has very convenient and comfortable access road.